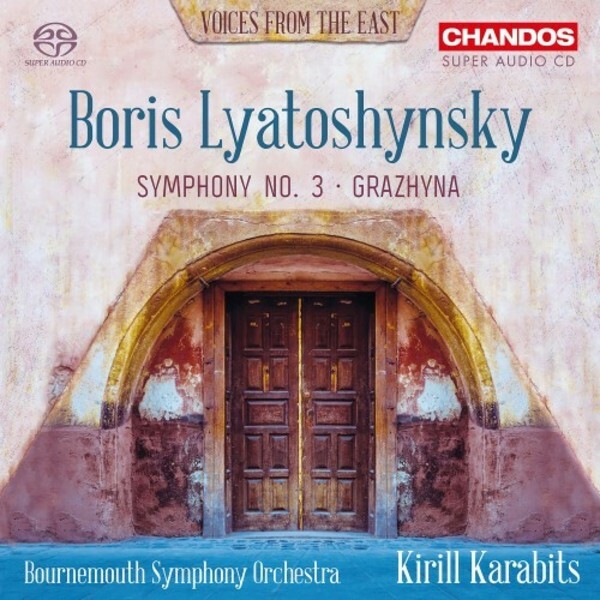 With their second album on Chandos, the highly lauded team of the Bournemouth Symphony Orchestra and its Chief Conductor, Kirill Karabits, presents another volume in their surround-sound series �Voices from the East�. This is music very close to the heart of the native Ukrainian Karabits: Boris Lyatoshynsky taught orchestration to his father, Ivan Karabits. Having absorbed the music of the Russian tradition and late-nineteenth-century Western European romanticism, Lyatoshynsky shaped his personal voice under the influence of twentieth-century modernist movements such as expressionism, as well as Ukrainian folk music, becoming a self-professed national composer. The premiere of Symphony No.3 could not be given until Lyatoshynsky had rewritten the finale to accord with Communist Party requirements, the original movement having met with objections from the Soviet authorities. On this recording the symphony is heard as originally conceived. The symphonic ballad Grazhyna was written to mark the centenary of the death of Poland�s greatest poet, Adam Mickiewicz (1798-1855). Both works are played by the BSO under a conductor whose musical decisions have the authority of one who directly embodies the legacy of the composer.